Lonnie Wheatley, EAGLE, Neb. (June 24, 2016) – It’s not the fanciest trailer in the pit area by far. One could easily walk by it without noticing. No matter though. 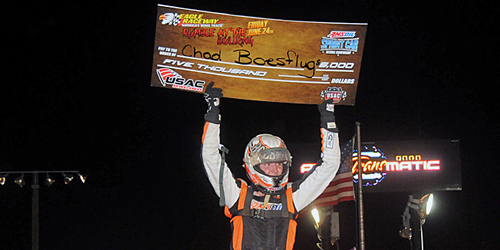 What they have works quite well on the racetrack as California native Chad Boespflug wired the field to capture his third USAC Sprint Car win of the year in Friday night’s 30-lap feature at Eagle Raceway. Boespflug gunned into the lead at the outset and then denied challenges from Brady Bacon and Dave Darland along the way to secure the win aboard the Claxton-powered NineEight Motorsports-EZR/Capitol Renegade No. 98 Maxim. “I had a really good car, you could really hustle it around the top of turns three and four and then I had to really hit my marks in one and two to keep those guys behind me,” Boespflug explained afterward. Starting from the pole position, Boespflug raced ahead of fellow front row starter Isaac Chapple at the outset and led throughout working the top side of turns three and four and the bottom portion of turns one and two. Working primarily the low side all the way around, seventh-starter Brady Bacon was up to second in the opening handful of laps and pestered Boespflug throughout. Thirteenth-starter Dave Darland worked the high side of the track throughout and joined in on the lead chase as well, taking second from Bacon for a substantial mid-race portion and challenging for the lead before the top side of one and two slowed too much. Wading through a number of interruptions along the way, Boespflug was flawless over the final seven-lap charge to the checkered flag to deny Bacon a second win in as many nights by little more than a car length. Darland filled out the podium in third with Thomas Meseraull and defending series champ Robert Ballou rounding out the top five. Quick Time: C.J. Leary established a new track record by stopping the clocks at 13.247 seconds. Heat Winners (starting position in parentheses): Brady Bacon (4), Ryan Kitchen (1), Robert Ballou (2). Heat Moments: The first caution of the night flew when Clinton Boyles got into a tussle with the turn two railing while running fourth with less than two laps to go, the front end took the brunt of it; Chris Windom had the second heat well in hand only to have an oil fitting come loose as the white flag flew, handing the win to local shoe Ryan Kitchen; Robert Ballou bolted in heat three with Boespflug outlasting Thomas Meseraull in the battle for second. Best Supporting Role: Joey Danley outlasted Jason Martin in an entertaining 305-ci Sprint Car feature event with Toby Chapman, Zach Blurton and Doug Lovegrove chasing the lead duo to the stripe. 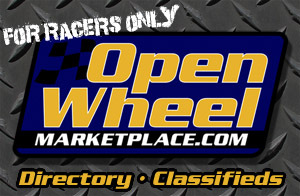 Martin led the opening rounds before Danley raced by for the lead. Martin battled back in the latter stages with the duo swapping wild sliders to settle the score. 2 Laps – Chase Stockon and Max McGhee get tangled up on the backstretch. McGhee makes a return with Stockson making a return as well after suffering a flattened left rear tire. 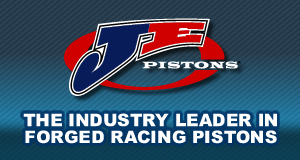 5 Laps – The red flag flies when Landon Simon tumbles down the frontstretch after C.J. Leary and Bret Mellenberndt got together racing for third position off of turn four. 8 Laps – Brandon Stevenson’s 360-spin make the yellow flag fly. 13 Laps – A second red flag flies when Stevenson gets upside down in turn two after a tangle that also includes Clinton Boyles. 16 Laps – Another 360-spin caution flies for Chris Windom after fighting for the same turf as Meseraull getting off turn four whilst battling among the top five. 23 Laps – A third unnecessary caution appears when McGhee loops it in turn four and continues on. “A” Main Hard Charger: One of three drivers to advance ten positions, Darland gets the nod by finishing third after starting 13th. PROSOURCE QUALIFYING: 1. C.J. Leary, 17GP, Dutcher-13.247, 2. Chase Stockon, 32, 32 TBI-13.321; 3. Thomas Meseraull, 66, Amati-13.417; 4. Bret Mellenberndt, 97, Mellenberndt-13.439; 5. Isaac Chapple, 52, LNR-13.503; 6. Chad Boespflug, 98E, NineEight/EZR-13.568; 7. Brady Bacon, 69, Dynamics-13.571; 8. Aaron Farney, 15F, Farney-13.614; 9. Max McGhee, 17, McGhee-13.626; 10. Rob Caho, Jr., 78, Caho-13.685; 11. Chris Windom 5, Baldwin-13.827; 12. Joe Bares, 19, TEST-13.828; 13. Dave Darland, 11, Walker/Curb-Agajanian-13.880; 14. Landon Simon, 24, LSR-13.902; 15. Robert Ballou, 1, Ballou-13.982; 16. Clinton Boyles, 77, Hockett-13.995; 17. Ryan Kitchen, 21, Kitchen-14.086; 18. Terry Richards, 18, TR’s Tool Service-14.427; 19. Brandon Stevenson, 0, Stevenson-14.626; 20. Alex Schriever, 0x, Davis-14.677.